Below is our most recent reagent color chart with instructions (last updated November 2018). 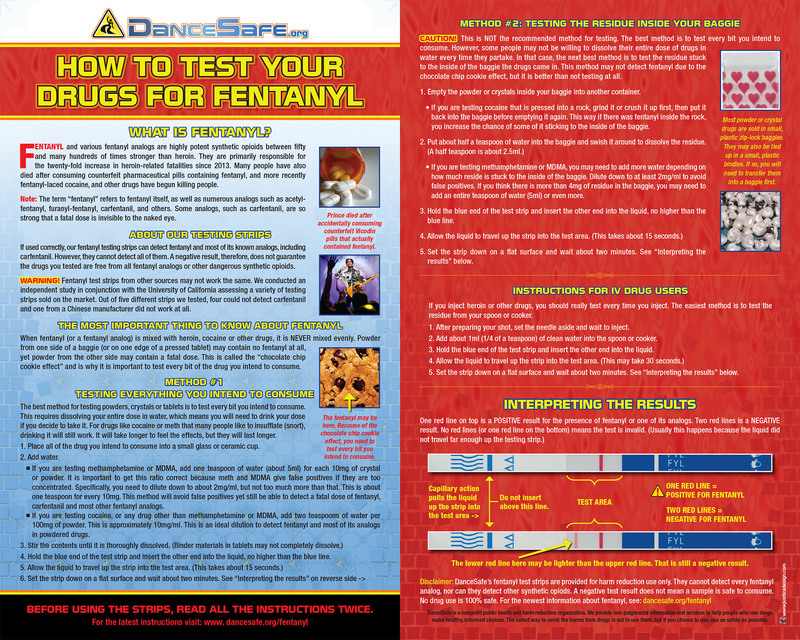 Scroll down for our most recent fentanyl testing strips instructions (last updated February 2019). IMPORTANT: Never have more than one reagent bottle open at a time. If you mix up the caps and put the wrong cap on the wrong reagent bottle, this may cross-contaminate the reagents and ruin them. Be sure to perform the tests in a well-lit location. Be careful when using the reagents, as they contain chemicals that can damage skin (we recommend wearing latex gloves). Keep the solutions far from your eyes and mouth. Also, make sure to clean up completely after each test. Take the reagent bottle out of the plastic safety container. Remove the cap and turn the bottle upside-down a couple inches over the powder . Squeeze one drop out of the bottle onto the powder. Be careful to not let the dropper bottle touch your powder or you will contaminate and ruin the rest of the reagent. Replace the cap. Observe the color change right away. 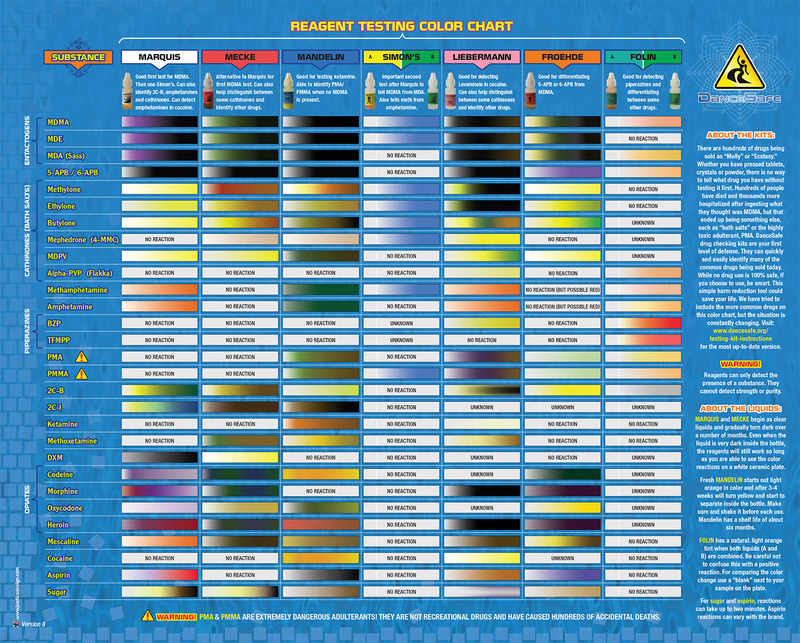 Use the corresponding columns of the color chart included with your kit to evaluate your test. If the reagent either does not change any color during the first 30 seconds or if it produces some other color-change sequence, then the pill definitely does not contain any of the above substances. It may also be highly adulterated with one or more unknown substances. You can use other DanceSafe reagents on new samples to look for the presence of other substances. Wash the testing surfaces with soap and water as soon as possible. The steps are similar to what you did using our other reagents. However, these two reagents require two bottles of liquid (bottle “A” and “B”). You will once again scrape off a tiny bit of your pill onto a clean white plate, carefully add a drop of liquid from bottle “A” (closing the cap tightly afterwards) and then to that add a drop of liquid from bottle “B”. The DanceSafe reagents are primarily sulphuric acid with other potentially dangerous chemicals, and are strong enough to burn skin and clothing. Keep out of eyes and mouth. Wear latex gloves when handling the bottle and cap. If you get some on you, then wash quickly with soap and water. Wash testing surfaces with soap and water as well. Dispose of any unwanted reagent down the sink with running water and baking soda. Store all testing kits in a cold, dark place such as a refrigerator between uses. 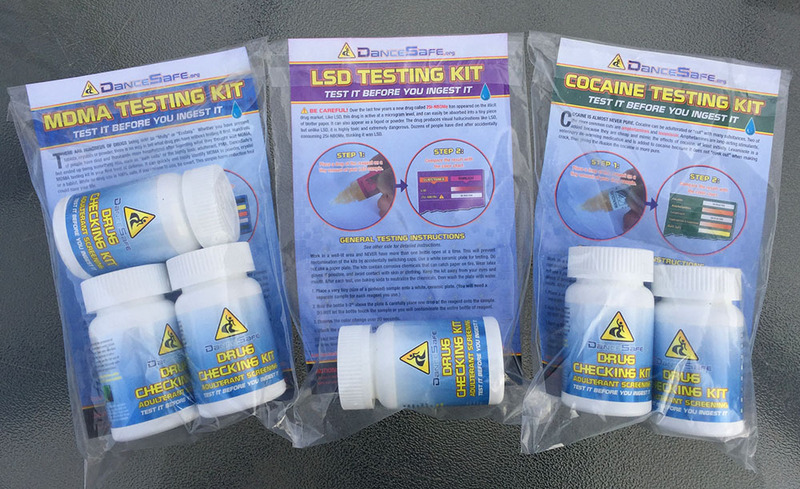 NOTE: DanceSafe Reagents can only determine the presence, not the quantity or purity, of a particular substance. Dark color reactions will tend to override reactions to other substances also in the pill. A positive or negative reaction for a substance does not indicate that a drug is safe. No drug use is 100% safe. Make good decisions. Can you tell me about how long a Mecke test kit can last refrigerated? Yes. Mecke should last 6 months to a year if refrigerated. Are you shipping only in USA and Canada? I purchased a Mecke from your site a yr ago and never used it, is it still good? why does the kit come in a container with a bunch of pebbles/beads? Will you eventually have/sell kits that can differentiate between the new research chems that are popping up? Stuff like 5-MAPB that supposedly still pops black even though it isn’t MDMA/MDE/MDA? We are always researching new reagents that might be able to distinguish various new drugs. The future, however, may lie in portable, affordable spectrometry. The technology is getting better and better all the time. We think one day reagents may no longer be necessary. 5-10 years maybe? That is a requirement of the Postal Service. It’s vermiculite, to absorb the sulfuric acid if it happens to break during transit. A year is likely too long, unless you kept it in a refrigerator the whole time. What if you want to test a sample that has been cut with multiple substances. Will the test kit default to the color of the most abundant substance, ie. if sample has MDMA and methylone what color would it turn? Depending on how well mixed the MDMA and methylone are, you might be able to see yellow and black side by side (with Marquis, for example). It also depends on the proportion of each substance in the pill. But in general this is going to be very difficult, and you can never be sure. Remember the kits provide only a limited, front-line defense. They are very good at ruling out samples that contain no MDMA at all, but they usually cannot tell you if the sample has been cut. Many drugs do not react at all to the reagents. The only way to know for sure what is in your sample is to send it to ecstasydata.org. So can these tests easily distinguish between MDMA and MDE? I can barely notice any difference in the Mandelin color swatches of those two on the guide sheet. I did the Mandelin a second time and noticed a very small puff of smoke. Does that indicate anything? On the Simon test, adding the second liquid turned the mixture to a very deep blue, not a light one like on the chart. Does that mean anything? Thanks DanceSafe!! You folks are really doing a service (and making it all sciencey is fun for me, too)! Unfortunately, as yet we know of no reagent that can easily distinguish MDMA from MDE. Both will turn blue with Simon’s. The reason the color chart shows a lighter blue is because sometimes people use a teen-tiny speck of powder, and in such cases the blue doesn’t get very dark. However, blue is the operative color. If it turns blue at all, something in it contains a secondary amine. The puff of smoke is a common reaction of sulfuric acid (inside the marquis, mecke and mandelin) with hydrochloric salts, of which most of these compounds consist (as in “MDMA hydrochloride,” etc.) It sometimes happens and sometimes it doesn’t, but doesn’t mean much insofar as identifying the compound goes, as a great many compounds can make the puff. Same thing with bubbles if you see those. And remember these reagent tests only detect the presence of certain compounds (or no presence). They do not detect purity. Do you know if somebody from Brazil has already imported the testing kit and actually received? Almost all pills that we find here are fake. I think more than 90% so the kit will be extremely helpful. We plan to start shipping to Brazil and all other countries soon. Stay tuned to the website. Are you allowed to carry dance safe kits on a airplane to festivals around the nation? Unfortunately, you are not allowed to carry testing kits on an airplane. They contain hazardous chemicals and passenger airlines prohibit them. You are not even allowed to check them into your luggage. I know it seems silly given that they are such small quantity, but that’s the rule. How are these packed and shipped? Our kits are packed in full compliance with all shipping regulations. We ship them in safety containers with vermiculite. They are packed discreetly with “D S” as the return address. Met some your people at a festival you guy’s are doing a good thing here. Why do you recommend the Mecke over the Marquis for extacy/molly? The way I am reading it, the Marquis may show more filler/fake/unwanted ingredients. Can you clarify why that test is preferred? What color are the solutions in the SIMON test kit. I think I may have swapped caps accidentally. The yellow bottle has a darker colored stain on the bottom of the plastic but the liquid itself is lighter in color. Is there any way to test if they are mixed or damaged? They have been in my fridge since I ordered them about 3 months ago. Super cold albeit, can that damage them? It is normal for the liquid in Simon’s A (yellow bottle) to change color over time. Your description sounds normal. Nothing to worry about. It will still work. Marquis and Mecke also slowly darken over time. Heat will accelerate this process. If they get too hot or get exposed to the sun for too long, the liquid can get completely black, which can mask the color reaction when you use them. At that point you should probably toss them out and get new ones. In the fridge that shouldn’t happen, though. But Simon’s A will go through strange color changes over time no matter what, and that’s perfectly normal. Good question Cire. The main reason was that Mecke reacts very distinctly to DXM, which used to be one of the main drugs in fake ecstasy tablets. However, today we do not see so much DXM anymore. This may make Marquis more useful. Truthfully, though, one should use all four kits. It is said that 4-5 new research chemicals come out *every single day*, and we have no idea how these things react to each of the reagents. For example, we recently tested a substance that look exactly like MDMA on every reagent except for Mandelin. Was it 5APB? Was it some new drug? We have no idea. Unfortunately, the user did not send any to the lab for confirmation. Would freezing reagents extend their shelf life? Or is freezing not recommended? How do you test if a reagent is still useful? We have researched this device and other spectrometers. Unfortunately, there isn’t a consumer model powerful enough to differentiate drugs (despite claims to the contrary). The cheapest models that work cost over $40,000. Just ordered my first complete testing kit from ya and was wondering if I could test my samples on a Pyrex cooking tray or does it HAVE to be ceramic? Do all the reagants last 6-12 months when refrigerated, or do some last longer than others? They should all last that long. Some will turn color as it reacts with the plastic, but they should all last that long, even if they get discolored. When using all four kits, i experienced some bubbling after i applied the chemicals. Would that indicate anything specific? I know these kits aren’t certain and they tell more whats NOT in them rather than what is. All of them tested similar to an MDMA substance with a few differences. But the bubbles through me off. do you ship to the UK??? I bought the kits in the glass bottles in 2007. Stored them in dark place at around 73°F. Are they still good. That’s a great question! We’ve never tested kits stored for that long. Bubbles are seen regularly, more often in powder than pressed tables. The binder in pressed tablets often reduces the bubbling. It doesn’t indicate anything, since it can happen (or not) with virtually any drug. Ok, it is forbidden, but do you think if it is inside my necessaire inside my bag, they will find it in the x-ray or something? Does this liquids appear in another color in the x ray? Thank you, i´m going from Brazil to Paris and Ibiza. We can’t help you with that. Everything is a risk-benefit assessment.